Applying our group of performers' know-how of their own cultures and their intimate knowledge of day-to-day life in Japan! This program intends to intermediate, of if necessary, break through the "Us vs Them"-dilemma that often inhibits and befuddles Cultural exchange.This experience is a precondition and prime facilitator in practicals like learning Foreign Languages, Appreciating Art, and the learning "to be with" the exceptionally dumb/clever. ; in other words a necessary ingredient in the lifelong school of learning to live with the unsuspected "Nail that sticks out". Group-life, initiations; personality-forming events and experiences in other cultures. 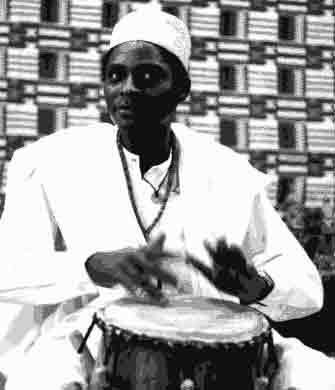 Orlando using the Talking Drum to have the children experience African war and love, nature and spirits by having the children, dance, sing.